That moment, when as someone who works in communications and reads a paper every day, I realise I missed the launch of a new paper - and now it is being shut down! So what went wrong with the New Day? Firstly, where was it available? I hadn't seen it in the 9 weeks it has been out. Distribution is key to capturing an audience. Secondly, how was it launched? I wake to the radio every morning, I watch news every night, I read the metro on the way to work, and I read the FT, Guardian, BBC, and Telegraph at various points in the day. I'm also never off Twitter and FB on my commute. So what was their launch and PR strategy and who was their target audience? Finally, the premise that the paper would be politically neutral and offer balanced coverage misses the point of what people are after. Although people say they want balance, and probably generally believe it, their behaviour speaks differently as the media outlets that are growing and most popular are those that offer more views than news. When trying to capture an audience the content (and how you PR it) is more important than the format. The New Day seems to have got it wrong on both fronts. 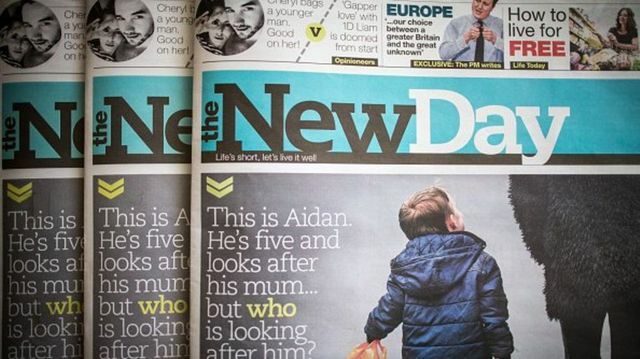 At launch, the New Day was announced as politically neutral and its publisher said it was aimed at readers who no longer bought a newspaper.